As more developing learners are diagnosed with learning disabilities, schools acknowledge a greater need for a more highly qualified Special Education teacher. Being a Special Education teacher is about more than just helping students to process academics, it’s about giving them the independence to learn and interpret their surroundings in a way they can easily understand. The impact a special education teacher can have on their students lives is profound. 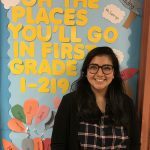 Alumna Jessica Paiz (2013) is a special education teacher in the first grade. I am a first grade special education teacher in an integrated classroom in Brooklyn. Field of education. In both private and public sectors. Part of my job includes working closely with another teacher (my co-teacher), who has her certification in general education. Together we plan lessons that coincide with state standards for learning and expectations. We discuss and plan the different ways that we can modify and accommodate the lesson content for our students various needs, as well as learning styles. Another big component of my work is communicating with parents and other professionals in the school. Being able to play a critical role in the learning and development of young children. Being able to see how much your students grow and what different skills they leave your classroom with. Being able to say that you are playing a role in crafting our future. Being able to work with a range of professionals. Ample opportunities for professional development. Ample opportunities for professional development. While it is great to be able to have various opportunities for professional growth and being able to learn and continuously develop yourself. It can at times seem as you are always attending a meeting and that you do not have enough time to plan. Having to follow a pacing calendar. Part of my job entails that my co-teacher and I follow a pacing calendar of where, or what lessons we should be teaching according to state standards and the different curriculums we use in the school. Being responsible for creating individualized educational plans for students with special needs. This can be especially scary if you are a new teacher, since these individualized plans need to be specific to each student and since they are legal documents. Being an English major helped me develop the necessary skills to effectively communicate with parents and professionals. Through my writing and presentations, I learned how to be articulate and how to confidently voice myself. As an English major I also learned the necessities of organization, proofreading and writing with support and research. I think this in particular is extremely important for me, as I am responsible for writing those individualized education plans. As a legal document, I need to ensure that it makes sense, that it reflects my professionalism and that I can prove any recommendations that I see fit for my student. I need to be able to clearly explain what my student’s areas of strengths and needs are, and if my student requires further support I need to provide the necessary arguments as to why. I got this particular job through a tip from a friend who told me that the school had openings, but I began my career in the Children’s Center at John Jay. Where I had my first job as a teacher assistant. For current students interested in this line of work. Do you have any recommendations on what they can do now to start directing their career path? I think one of the first things anyone can do if they think they want to begin a career in teaching, is to find a way to work with children. Whether it’s through volunteer work, an after school program or a summer camp. I think having exposure to what working with children is like is important. You want to build confidence around children, learn what your style of teaching and communicating with children is like. You might find that working with older children is more appropriate for you then working with younger children because the needs of children and how they communicate change as they grow older. But I think the fulfilment you feel comes with the job regardless of the age group.